It’s been a while since my last blog post. I’ve been busy working on a number of activities. As a result, I have a lot of news to announce regarding the web-based editor, previously known as the AKN/Editor, that we originally built for the “Unhackathon” back in May. As you might already have guessed, it has a new name. 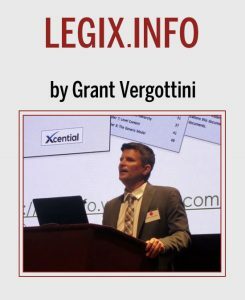 The new name is “LegisPro Web” which now more clearly identifies its role and relationship to Xcential’s XMetaL-based standalone editor “LegisPro”. Going forward, we will be migrating much of the functionality currently available in LegisPro into LegisPro Web. I just got back from a vacation in Denmark – the land where Legos come from. I thought it might be appropriate to spend some time talking about Flavio Zeni at UNDESA calls Legislative Legos – building blocks that can be used to build legislative systems. Why is this such an important concept? Well, it’s all about managing risk and building a system that can adapt to change in timely manner. Legislative systems can take years and cost many millions of dollars to develop. As the sophistication grows and automation takes root throughout the organization, these systems become extensive mission critical parts of the organization’s fabric. So failure is not an option. Why Not Build a Legislative Editor out of Google Docs? Ever since I started working on my legislative editor (http://legalhacks.org/editor), I’ve been asked over and over if I was using Google Docs, and if not, why not. So to answer the first part of the question, the answer is a simple no. I don’t use Google Docs or anything like it. Why is Building a Legislative Editor so difficult? Ever since I announced my HTML5-based XML editor, I’ve been getting all sorts of requests for a variety of implementations. While the focus has been, and continues to be, providing an Akoma Ntoso based legislative editor, I’ve realized that the interest in a web-based XML editor extends well beyond Akoma Ntoso and even legislative editors. Over the past few weeks, my posts about the HTML5 editor I have been working on have received a lot of attention. One aspect that I have noticed throughout has been people equating legislative markup to XBRL. In fact, I have taken to explaining Akoma Ntoso as being like XBRL for legislation. That helps people better understand what we are up to. Well, we had our “unhackathon” and it was, overall, a great success. We learned a lot, introduced a lot of people to the notion of XML markup and Akoma Ntoso, and made a number of important contacts all around. I hope that all the participants got something out of the experience. In San Francisco we were competing with a lovely Saturday afternoon and a street fair outside – which people chose to give up in order to attend our event. At UC Hastings we had a special visit from State Senator Leland Yee of the 8th District which was most gratifying. He has been a strong proponent for government transparency and his surprise visit was awesome. This past weekend I came across this interesting block by Abe Voelker. GitLaw: GitHub for Laws and Legal Documents – a Tourniquet for American Liberty. The reaction he got was amazing and totally overwhelmed him. An HTML5-Based XML Editor for Legislation! UPDATE: (May 17, 2012) For all the people that asked for more editing capabilities, I have updated the editor to provide rudimentary cut/copy/paste capabilities via the normal shortcut keys. More to follow as I get the cycles to refine the capabilities. I’ve just released my mini-tutorial for the HTML5-based XML editor I am developing for drafting legislation (actually it’s best for tagging existing legislation at this point). Common Identifiers or a Common Data Format. What is more important? I just read this excellent post by Tom Bruce, et. al. from the Legal Information Institute at the Cornell University Law School. Tom’s post brought to mind something I have long wrestled with. (Actually so long that it was a key part of my job working on CAD systems in the aerospace industry long ago). I sometimes wonder if having common identifiers isn’t more important than having a common data format. The reason is that being able to unambiguously establish relationships is both very difficult and very useful. In fact, one of the reasons you want a common format is so that you can find and establish these identifiers.